Our reviewers present their Top Ten discs from the past year, with new releases from Tad Robinson, The Bo-Keys, Ricky Fanté, and The Holmes Brothers showing up on more than a few lists. All of the lists can be found in this issue's Pick Hit. 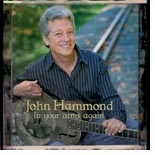 Blues veteran John Hammond just keeps getting better. A pleasant surprise is that he's now recording some of his own compositions. In Your Arms Again is this month's for our Surprise pick. Our regular soul dude reviews a collection of classic recordings from Willie Hightower in this month's Flashback. This month's What's New section features new releases from Scott Bradbury, Downchild Blues Band, Jay Geils-Duke Robillard-Gerry Beadoin, The Breeze Kings, Ben Harper with the Blind Boys of Alabama, and more. Looking for a particular review? Check our Index by Artist Name. Please sign up for our e-mail distribution list. Blue Night Productions. All rights reserved.